We don’t want to gush, but this one just may be perfect. Irish Distillers stubbornly adhere to their time-tested methods and practices for making the world’s most popular Irish Whiskeys, including Jameson, Powers, Paddy, Redbreast, Green Spot, and Midleton. The Good men at Redbreast set themselves apart by being one of the very few remaining single pot still Whiskeys and provide four variants of it — all of them top-notch. Redbreast is known for three things: quality, quality, and quality. Their Whiskeys have even been called “masterpieces.” Redbreast 12 YO Cask Strength is a proud member of this product range winning a slew of awards itself, including the coveted “Irish Whiskey of the Year.” With a resurgence in popularity, we seem to be entering a new golden age of Irish Whiskey, so there are a lot of really good ones out there right now, but Redbreast 12 YO Cask Strength just may be a 58.6% ABV single pot still dram of perfection. Only a handful of Irish Whiskeys still use the single pot still process. Oddly, it's not about a specific type of still. Rather, it means using a combination of both malted and un-malted barley in the mash. And where a single malt Whisky is usually distilled twice, single pot still Whiskey is usually distilled three times. What does Redbreast 12 Year Old Cask Strength taste like? The Flavor Spiral™ shows the most common flavors that you'll taste in Redbreast 12 Year Old Cask Strength and gives you a chance to have a taste of it before actually tasting it. Just exceptional. Pear is dominant on the nose. Buttery with citrus and oak. Simply incredible. Sweet vanilla and maple meet cinnamon in a long, smooth, inspired finish. One of my favorites. My favorite bottle. Smooth as French silk. Light and creamy. Very approachable. Brings a year to your eyes. In the best way possible. Truly exceptional. 7 stars neat, 8 or 9 stars with 1 rock(ice) in it. flavor totally changes with a little dilution. Opens up into a different spirit. Unbelievable smell, taste, and finish. One of the best cask strength whiskeys you can find. It is so smooth you find it hard to believe it has a higher alcohol content. When I first opened the bottle, I just sat and smelled it for a long long time. And then, I tasted it and loved it soooo much. An actual and sentimental fav. Incredible. Notes of vanilla, sherry, cherries. Best lightly diluted with distilled or filtered water. This is a truly remarkable whiskey. As a bourbon guy at heart, I wanted to dip into Irish whiskey, and decided why not get the cask strength version off the start. Absolutely thrilled that I spent the money on this. Some reviews are describing it as hot (which is fair as a cask strength), but compared to other similar proof bourbons, like stagg jr and eh taylor small batch which I have stocked at home, this is unbelievably smooth. The finish is probably my favorite out of all of my bottles I currently have. While I get a lot of caramel up front with a bit of spice, the finish is nothing but buttery, vanilla glorious-ness. Even after the heat fades away, I am left with a buttery coating that I personally love. The only reason this isn't getting a 10 from me is that I still prefer the overall package of bourbon, but this will certainly have a permanent spot on my shelf going forward. I "discovered" this many years ago at a store in Dublin. The shop keeper told me this was the one to get. It has been my favorite ever since. I love this Irish! Sweet, smooth with plenty of kick. Definitely one of my favs! I generally prefer the Red Breast 15 to the 12 but I have to say that this cask strength variety is really amazing. As good as the 15 year. Very enjoyable, the buttery richness of it makes it one of my go to whiskeys to pair with a steak. One of my Favorite. love the taste. Tasting notes are spot on, except "cinnamon apple cobbler" sets you up for a let-down. Hit reset and enjoy the oh-so subtle oak. Not the usual vanilla. Since they didn't offer Tullamore DEW as one of the "only bottle"options, I chose this. One of my favorites. Smooth. Reminds me of simpler times when I was unemployed but life was still good. I have been a long time Irish Whiskey drinker, I have tried all the favorites. This one is hands down, the best I have tried. very smooth finish. My goto is Jameson typically but once you try this it will be hard to pour anything else. This is a really great cask whiskey. It is quite hot, but I like that in a whiskey. The whiskey is mellow, and smooth, which goes surprisingly well with its striking flavors, although not bold, and heat. I would get a bottle of this again. All five guys that tried this thought it was a TEN! Nice and spicy but finished smooth, the mouthfeel was sensational, the flavors lingered. I switched from Jameson to Tullamore Dew because it was smoother. Apparently I had no idea what smooth was until I decided to give Redbreast a try. I am now a believer. Very good whiskey. This has been my favorite so far! This is the best thing I've discovered so far on Flaviar. I haven't tasted this in almost a decade and the impression is still firm in my mind. One of the best Irish whiskey's I've ever had. One of the bests. Smooth from start to finish. This is a great sipping whiskey. Absolutely fantastic. Probably the best Irish whiskey I've had. I think I'd like to try a sip or two. I have been sipping Redbreast for a couple of years and find the plain 12 year to be quite excellent. I don't find the 12 year cask strength or 15 year to have significantly more pleasant taste. On a recent trip to Ireland I found it interesting that many of the bar tenders said they would recommend it over several other brands. But it always comes down to personal taste. But as the reviewer said there are a number of excellent Irish single malts out there. Teeling, Green Spot, Yellow Spot, Tyrconnel to name a few. Smooth and wonderful. Best Irish I have tasted. Can't afford not to have it in the cabinet. 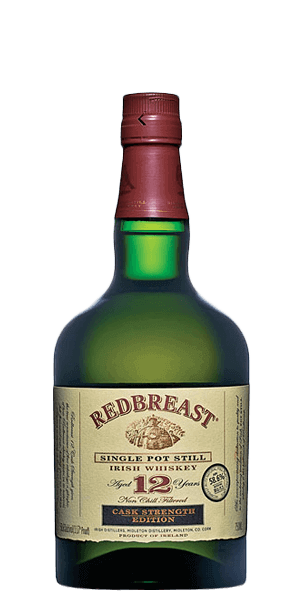 I love Redbreast, so, so, so wish I could afford it!!!! !